These amazing Water Sport Shoes are perfect for swimming, walking, running...you name it! They are made from water-resistant material that keeps your feet comfortable and dry. The material is durable and safe, too. 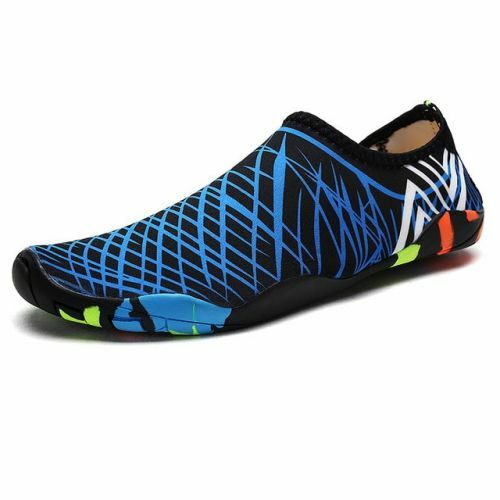 Whether it's yoga, swimming, or taking a hike through nature, these shoes will give you a wonderful experience during your activities. DURABLE MATERIAL: 92% polyester+8% spandex on upper shoe area. Breathable, lightweight fabric with fine stretch material that is flexible and comfortable. COMFORTABLE FIT: Soft and smooth material prevents irritation to skin when wearing the water shoes. The rubber sole is made from anti-slip material that is flexible and made to protect your foot. The thick rubber allows you to walk on stones, gravel, and pavement without worry. These amazing shoes fit your foot like a glove. LIGHTWEIGHT: These shoes are extremely lightweight and comfortable. You'll be able to move with flexibility no matter what you're doing. They are compact and easy to pack or store. Great for a variety of sports. ALL OCCASIONS: Whether you are swimming in the creek or hiking in another country, you'll enjoy the comfort and durability of Water Sports Shoes.